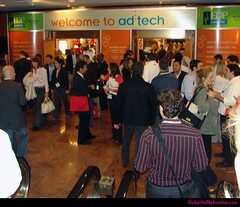 While both seem to be a work-in-progress so far, ad:tech New York launches today with a predicted 10,800 attendees. Running around frantically, I will be keeping a photo blog of up-to-date geeky craziness at Flickr, so keep checking back for occasional cleavage and cheesy booths. Please, if you're reading this, go ahead and update your bookmarks to ShakeWellBeforeUse.com, as the Blogger site will soon be fading into the horizon. Also, to subscribe to the new site, the feed can be found here.